Housepets! - View topic - Help wanted! Okay, so this past week I've been writing the next update to my story "Housepets: Pet Project," and things were going pretty well, until I hit a bit of a snag. For those that have been following the story up to this point, the eponymous project is about to start. Then, when I started writing, I realized that my creative brain juices were not powerful enough to populate an entire city with interesting and well thought out characters. That's where your help comes in. Stolen from Inspired by fellow writer Valerio and his contest, I would like a bit of help populating the pet city. Like his contest, this will be on a "first come, first serve" basis. There will be 5 major character slots open, and after that, 6 or so "extras" slots will open up. Major characters will be, wouldn't you believe it, actual main characters in the story and will have many interactions with the main characters of the story. "Extras" are just like they are in the movies, they will appear in the background when needed and will make occasional reoccurring appearances. Do not underestimate the importance of an "Extra" though. They are, in reality, quite important and will allow me to add a bit of realism (well realism relative to the nature of this story) to a pet populated city without sacrificing too much attention to the plot. After all, what is a painting without shading, or food without spices? The project strictly allows dogs and cats. It is in fact a plot-point. Also, keep all of this within the PG-13 rating, just like with the rest of the forum. One final cautionary note, once submitted I may have to change some details in the character to allow to it to fit within the universe of the story, especially plot heavy characters. I apologize if that offends anyone. For those of you that are "Pet Friendly" fans, this process should be familiar to you. For those that aren't, that's okay. I have rewritten an outline of sorts for all of you to follow. Just about anything goes for this section here, a great deal of nationalities are involved in the project after all. This decides whether or not your character is a villain or a good guy. However not everyone is pure evil nor are they pure good, sometimes they fall inbetween. This Handy Chart should help guide your decisions on what alignment you would like your character to be. Just a note, I don't want too many good leaning characters nor too many evil leaning characters, but beggars can't be choosers. Like I said earlier, cats and dogs only. However all breeds of either species are free game. I was never quite sure of how pets aged in universe, so this has been one of the mandatory fanfic writer canon deviations. I always figured they lived a long time, but anything beyond 45 would be considered "old." Just keep that in mind. The little nuances in your character's appearance. Color of their fur, any patterns on said fur, any clothing, their weight, their height. All of that wonderful stuff. A rough summary of your character's personality. I would like, at the very least, three "perks" in their personality, and conversely I would like three "disadvantages" in their personality. This is where you tell me the history of your character, an explanation on why they are, well, the way they are. A few more nuances in your character that won't fit anywhere else. Things like odd habits or verbal tics should go here. This part is optional. It might give me a little more insight into your character's capabilities, but if you don't want to add this part of the description then all is well. Also, the max points are 42, just like in Pet Friendly. Extras will be given more leeway since they are not particularly plot heavy. There are however a few things I would like from them. Like above, but no need to go too crazy with it. Once again, like above, but don't go too in depth. Where would you most likely see this character? What would they be doing in said locale? Okay guys and gals, that should wrap up my set of rules. If you have any questions, please feel free to PM me. Thank you for your time and potential contributions! Last edited by Honorable Intentions on Sat Apr 06, 2013 2:04 am, edited 1 time in total. Just a normal black cat with yellow eyes. she has a crescent moon shaped patch of white fur on her back. She normally wears a dark blue collar (I don't know if the pets in this project are going to wear collars) with a tag shaped like a crescent moon. She's really friendly, striking up conversations with anyone she meets. The problem is that she also likes messing with people and making their life a little harder. Sometimes she goes a bit too far and makes their life a whole lot harder, and she doesn't even know when she's done this. So don't trust her with secrets, she might just decide to tell someone. If you're carrying something breakable, she's the type to try and trip make you drop it for fun. If you're trying to do something quietly, and ask her to be quiet, she's the type to yell "why?". She doesn't think about her actions much until after she does them, and she's usually just fine with whatever results come about. However, all things considered, she can be a pretty good friend when she needs to be. When she was a kitten, she lived on the streets. She was fine until she made a misstep on a fence and cut her back pretty badly. She was found by John Masters, who tried to disinfect the wound with hydrogen peroxide so it wouldn't get infected while he looked for an all night animal hospital. unfortunately, this permanently bleached the fur around the wound in the crescent shape she has on her back now. after that, she lived happily with John. When the chance to join this project came along, she said "sure, why not?" and so she signed up. -She's fairly nocturnal, going to sleep at sunrise and waking up at noon. -She likes walking outside at night to see what kind of cool nocturnal goings on are... going on. He wears a red collar with a gold and blue water droplet as his tag with an engraving of their family's coat of arms at the back. He’s a bookworm, fairly quiet and intelligent. He really enjoys eating food and loves listening to classical and acoustic music. He prefers staying indoors and usually interacts with a fairly small group of friends. Due to his experiences in the past, he dislikes cats and will never approach them or talk with them, but if you force him to be with a cat, he can stay pretty well-mannered and civilized. He is always constructing elaborate and well planned schemes against them but most of his plans fail due to his clumsiness. In short, he looks like a typical quiet, educated and lovable dog, but inside, he has something else in mind. Nestor Brosa is the pet of a fairly wealthy Duque in Spain. He is well educated and had his own personal tutor. As a pup, he was always playing around the Palazzo’s courtyard with some of the local pets. But the neighbourhood cats have always bullied him for being too smart for his own good and thus his anger on cats slowly grew over time. He had always tried to keep the cats away from the Palazzo but the head of the Duque loves all animals and didn't like discriminating against the cats. This created some minor conflicts between the Duque and Nestor. He started scheming and these schemes earned him his nickname, 'Lexter', a shortened version of Lex Luthor. When Lexter heard about the project, he vowed that he would take the opportunity, and use his knowledge and power to make every cat’s life miserable. He will rarely skips his siesta after his meals. He also loves to bet with anyone, even cats, against almost anything (all of his luck goes here). He is addicted to tomatoes. On some occasions, he can make a tomato appear seemingly out of nowhere and just snack on it. You KNEW I wouldn't miss this chance, man! 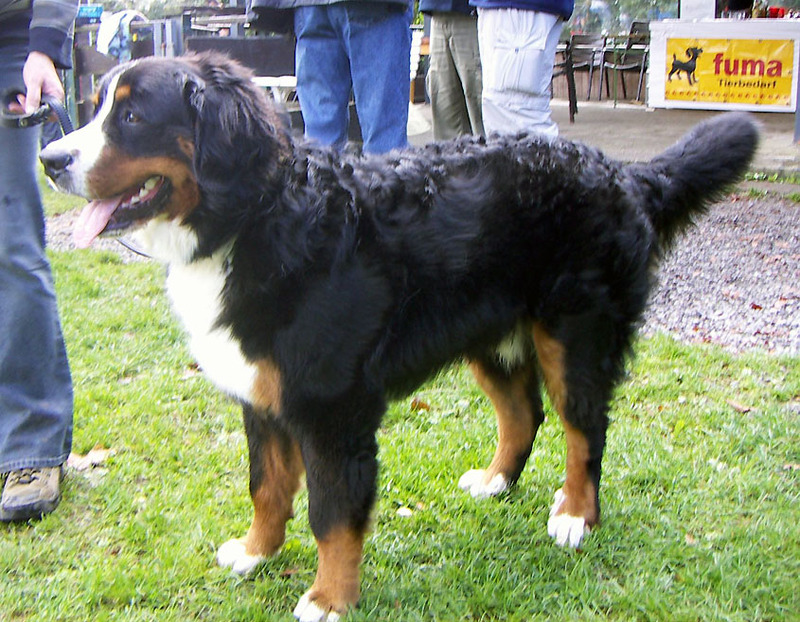 Classical BMD pattern, mostly black with a white strip running in the middle of his face and down to his chest. Orange arms and legs, with white gloves and, curiously, two silvery spots over his eyes. Eyes, deep blue. Absolutely in best hulking shape, long and fluffy fur, big floppy ears. His tag is round, white, with a red cross. He bring the 'better safe than sorry' concept to its extremes. He's very scrupolous and tends to be hypercritic toward the others when it comes to safety measures. But, on the other hand, he's also one who'd throw himself in the path of a van to save someone, even an enemy. He has few patience for those who, despite instructions and/or his best advice, won't just follow them and put themselves into troubles. As a former rescue dog, Amadieu is an excellent swimmer. He can just sit all day long in a spot and examine the surroundings patiently in search of problems or potentials problems. His owner is a retired diver from the rescue service, and the two share a very strong bond. To help his Dad, in fact, Amadieu would break his own rules without thinking twice! Amadieu was born in a breeding farm and immediately sent to the training center for the local sea rescue service. There, he eventually met his partner and future Dad, William Kirkstrong Champions. The two worked together as the best team of their unit, even winning several awards...until their helicopter fell into sea during a mission. Amadieu made it in time to rescue only his partner, a thing that still haunts him today for the dog feels he could've done more instead of focusing on William only. William had suffered two fractures, arm and leg, and his career was over. William retired and Amadieu followed him. Both still work as safety consultants for schools and police occasionally. Despite his protective attitude toward everyone, Amadieu seems hardly capable of making friends or socialize. It's as if he treated everyone like...job, rather than persons. It's a professional hazard, Amadieu has learnt to avoid empathizing too much with his quarries so that he could better perform his job. In fact, in some cases he had to stun his quarries so to carry them easily to safety. Strength : 9 "200 pounds...1, 200 pounds...2, 200 pounds...3"
Perception: 8 "One can't DO his job without being alert, right?" Endurance: 8 "I can carry you through the Atlantic if necessary." Charisma: 5 "Meh, I don't need you to love me, just follow orders and play it safe!" Intelligence: 4 "This is not a job for brains, you know?" Agility: 5 "Just toss me down where I need to save that guy, the rest is muscle!" Luck: 3 "So I'm not a lucky pup. My colleagues were lost at sea, they had it worse." Last edited by valerio on Sat Apr 06, 2013 5:36 pm, edited 1 time in total. Yay! I definetly must participate on this! I may not be too good on this, but anytime you need something like characters or looking for some ideas, I'll be there to help. He is completely white with unoperated ears. Despite his age is quite muscular and has dark blue eyes. He wears a brown leather collar with a pike as his tag and a belt with pockets of the same material because he always likes to carry anything he might need. He's usually very cheerful and positive. Despite being strong by nature, hates violence because of his past and only used when the time actually required and doing the least possible damage. He's always very active and when he has nothing to do or can not concentrate on something he gets to train. Jealously protects those who are close to him. He's not the type who likes to get in trouble but rather he ends involved in other's problems. But also because of his excessive curiosity to explore he tends to get into many problems when entering in private property without permission. He is very friendly and sociable, but because of his appearance it costs quite earn the trust of the people. Furthermore, he irradiates courage through every pore of his skin, making others feels brave with just having him at their side. He dreams to become a firefighter when he grows up. After he was born, was sold for use in illegal dog fights. He escaped but what he saw left him scarred for life, what made him decide to never be guided by the path of violence. Soon after he found three stray kittens being beaten by a big adult dog for a piece of meat. He defended, took care of them and after a while they became siblings. He lived with them in the streets for a while until they were adopted by a pet marriage (a dog and a cat no less) who had recently immigrated from Germany attracted by the new laws enacted under President Peter Hooke. They lived together with their owners as a family during a year and half until the project was unveiled. However, when they arrived at the airport, his excessive curiosity brought him into a place where he should not and take a different flight, separating from his family. Once landed, he decided to go towards Babylon Garden on their own, even though his family might try looking for him (not very smart to say). His only goal now is to find them and nothing else, no matter if they're there or not, he would continue looking. However, seeing that the kid was alone, the city authorities decided to not let him out of the place and take care of him until his family comes to claim him. *He likes to plan his activities, as an hour to play video games, one for movies, another for walking, etc (except for exploring, that's happens whatever be the occasion). *He always likes to keep on his pockets whatever he find that seems useful. *As a unnamed stray pup, he had to put himself his own name though as a kid he chose the first cooler thing that came to his mind. The nickname was given by his younger brother since he have really hard and sharp nails that grows too fast by a congenital issue. He have to cut them everyday, though sometimes he prefers to take advantage of them and use them to reach high places. In short, he have the dreamlike paws of every declawed cat. Last edited by Gren on Sat Apr 06, 2013 2:23 pm, edited 3 times in total. Alignment: depends on his mood which considering his power makes him very dangerous. Personality: kind, loving ,secretly a lucario who become the most powerful being that ever did or could exist in the infinite dimensions of the multiverse and accidently warps reality whenever he turns in his sleep, and hates bino more than anything ever could. Has irrational fears of barbies and other " girlly stuff", fire and large birds. Travels through universes to view interesting events and time travels if such events have already happened. His 5 favorite universe to visit(including their sub-universes) are channel awesome-verse, power rangers-verse, transformers-verse, Alex rider-verse, and of course housepets-verse. Thinks the pet project will be "interesting to watch considering this universes crazy politics." Bonus: is best friends with king and fox who are the only ones who know his secret. The only reason he didn't wipe their minds is because he told them in the first place. Stats: he's a reality warping god what do you think his stats are? Sorry to say it but I don't think I can use that character. I should have specified in the rules no "supers," and his background makes him seem more akin to the creatures that populate the same dimension as Pete and Spirit Dragon. Tell you what, I'll let you reserve the slot if you want to revise the character, or you can make a new character if you would like. Whatever pleases you best. Awesome entries guys thank you so much! You do not realize how much this helps. With that said, I'll await Legotron's response, but his entry (potentially) marks the 5th character slot. Personality: jack might be the worlds greatest inventor. He has contracts with NASA the army and multiple company's. he has build more inventions than any other pet or human ever did or could. He's build weapons robot and vehicles that are the most advanced on the planet. Outside of his work he's kind funny and quirky but if you push him to far expect to wake up in xenomorph hive in another dimension. The only people who will never suffer that fate are peanut grape fox king the wolves Keene and Martin foster. Has a extreme obsession with power rangers and transformers which ate the best way to bribe him if you can get a rare one. has a irrational fear of barbies. Has a kinda weak body but just wait until he finishes that full size megazord. Apperence: looks like a blue weaker version of fox. Has purple lines like circuits going across his body. Background: no one knows and those who find out are disintegrated. Last edited by Legotron123 on Sun Apr 07, 2013 10:19 am, edited 1 time in total. 1) if he's such a genius, why is his intelligence only at a level 9? you'd think you'd go for the 10 point maximum on that stat. 2) I don't think this character really seems like he'd fit in H.I. 's fic universe. I'd understand him being a genius and maybe being an inventor of cool things, but I'd suggest keeping the technology he's developed to maybe a slightly higher level than what is currently available in our universe. Giant robots for the military seems a bit too far. also, I don't think these characters are really supposed to know any of the characters from the comic yet. Personality: Lewis makes a living doing comedy reviews of bad comics book movie etc. on the Internet. He is insanely loyal to his friends and his infinitely growing fanbase. His reviews have a ongoing plot with villians like mechalker, dr. lewsano, king vyce, the creature, and a human from a alternate dimension called the gunslinger. His allies in the show are a cat called Harvey goodvoice, a robot called collo (pronounced coy- oh) a dog called 00s kid, a cat named pirate-style dancer and his magic gun which was created by power hungry ferals using a evil ritual to put a human girls soul in a gun which gave her control of her unwillingly new body. Is a very helpful in fighting evil both in his show and in real life. Appearance: is mostly white except for a brown pattern that makes him look like he's wearing a jacket. Is never seen with out his brown hat. Background: never talks about it says its " too boring." Last edited by Legotron123 on Sat Apr 06, 2013 9:27 pm, edited 2 times in total. edited my post under 'appearance'. And glad to be of help! Looks like I missed out! Darn work and my hectic real life getting in the way!! Personality: A bit of a social cat, but his awkwardness around other pets makes him seem a bit needy and insistent. When he first meets someone, he is very quiet and stutters when he does talk, but if you get to know him well, he opens up and you cannot get him to be quiet. Because of his shy nature, he tends to be a loner, walking around aimlessly in public just to be around other pets. Locale: Usually just aimlessly walking around town, sometimes in the park. He tends to people watch from small restaurants and diners. Simon has a stubby tail? Appearance: Base color is white. She has black and brown spots over her body and wear a blue collar with a pi shape. She is in a wheelchair due to atrophy. Personality: Kind, talkative, and flirty. Also mischievous but occasionally show motherly wisdom. Locale: Usually found exploring the plaza but can be found in the park as well. I have a question: can I participate again for the extras or that's only for those who had no participated yet? Edit: by the way copper, Simon is a male or female? Give some other people a chance to submit for now, and if there is still room later on (which I am sure there will be), then by all means add another supporting character to the mix. It was supposed to be a joke that the name made everyone think she was a he, but then last minute decided just to make it a he... so yeah, originally female that I made male. 1. Unfortunately an earlier "major character" submission did not meet the standards I had hoped for and I am not taking the entry. That being said, a late comer had submitted a character to me and I had said submission on standby in my PM inbox. He should be uploading his character here to the thread soon to replace the other entry. 2. Since I now have all of the major characters pretty much submitted, I have commenced writing the next update. Hooray! However I would like to request that the thread stays open for just awhile longer so that the minor character slots can be filled in. Thanks to all of you who have submitted to the contest and doing so in a very timely manner. You guys are awesome. Hopefully I do not disappoint with your characters and I look forward to introducing them into the story. Appearance: His fur is completely black, save for brown around his muzzle and feet. His "socks" end in a swirl that goes around each limb up to the joint that connects it to the body. He wears only a thin collar that connects into a tai chi circle. Personality: He is a dog of forced restraint, giving very little to the naked eye. He rarely shows emotion and never gives much away. This means he is hard to know, but also that he can be trusted with a secret. He follows what he calls the "Dragon's Path", and will always take up the losing side, playing Devil's Advocate on many occasions. He believes in a balance, and any altering of said balance should be destroyed, whether good or bad. He never goes into excess and rarely shows any emotion. He is, however, a big Detective fiction otaku, and will talk at length on Holmes, Poirot, Father Brown and the like. Background:He was a stray brought up in a Taoist Monastery, where he was taught to be a monk. He learned all of the martial arts they had to teach, and became quite skilled, though he never wished to use them. In a sudden uprising, the monastery was destroyed, along with most of the monks. He fled with the remaining monks, trying to find purpose to what happened. The trip to safety for him taught him about a balance, and the only way for him to come to terms with what happened was to believe that the home he knew was just collateral damage and had to go so that the uprising could be quelled, keeping everything in tune. He has come from Southern California to participate in this Pet only city, knowing something significant is happening. Misc. Notes: He believes in following the dragon's Path, and will always take up arms against an overwhelming force to keep a balance. This means that if the tide of good is about to crush evil, he will intervene, just as he would if Evil were to gain too much of an upper hand. He will not switch sides, but he waits until one side or the other becomes too outmatched. If it is an even battle, he will only observe and allow things to go their natural course. There you have main #5. Thanks again! YAY! I can't wait to see the next chapter and all of this awesome characters! Wow cooper, your character is pretty cool! He would be perfect for a movie. The background is so epic and something tells me that he will be playing for both sides (like some double-agent monk? XD). He seems to be not too friendly though, specially with the ones who can alter the balance, so I suppose he will not see with good eyes characters like Keene, Pete, Tarot and Alana. Change Simon to a female then! I do not mind! Also, I can write you know, I just do a lot of stuff in real life. By the time these contests come around and I get to look at them, they have been on for at least 12 hours and all the good stuff is taken. I rarely get a chance to participate, I just lucked out in this one. By the way copper, why the name "Torii"? I think it means "bird" in Japanese but I'm not sure if that was your intention. 鳥居 is a type of gate used in shrines in Japan. Not sure if that's the intended origin though. I'll see about getting a side character up here. Wasn't getting any inspiration earlier, but I'll see. Appearance: steve is a plain black dog. Jack is black with orange spots. Background: steve is a ex-police dog. His mate died giving birth to jack and he promised her he would protect him no matter what. He tends to take that too far. He never had a owner, so he always slept in the police house. He quit because he thought it wasn't a good home for jack. He's still good friends with fido. He's coming to the pet project because he hopes it will be a good home for his son. Jack has a wierd mental condition. (Mental condition sounds much worse then it is) This means he has trouble with social interactions and spends most of his time focusing on transformers, power rangers, and pokemon. He tries to make friends and "stretch the limits of wierdness." He doesn't like the stereotype that people with aspergers are jerks and blames that on people on the Internet claiming to be aspergers so they can get away with stuff. Jack rarely activly tries to hurt anyone. if he finds out he has acidently anyone he will immediately apologize. However he has no sympathy for jerks like bino. Jack doesn't really care about where he and his dad lives as long as it has Internet. Personality: steve is kind and serious, but acationally slips into a immature mode whenever he's really happy. Try's to make friends but if you in anyway hurt his son expect to find your self dangling off a bridge by a bunge cord with your ears stapled to your eyelids. Jack is really nice and funny, but if you push him to far he will snap with rage and then spend 15 minutes crying in a corner. He's always really excited in a way not unlike peanut. He is secretly much smarter than anyone, even his dad, knows. Local: jack would be somewhere with privacy and free Internet. Steve would be either working as a rent-a-guard dog or beating up somebody who hurt jack. Last edited by Legotron123 on Tue Apr 16, 2013 8:28 am, edited 3 times in total. All the main slots are taken, Lego. Only extras left. which I suppose you covered most of there, but the SPECIAL stats and background were unnecessary, and you still need locale preference. They were supposed to be extras. I just thought their characters would be better described with the background. I just did the stats for fun. Also I added the local so I assume their good. of course I "assumed" jack and Jill was a good movie. Isn't supposed that it's just one character per participant? well, it was never really stated, and as far as I know he accepted both of Copper's characters. Goodness I'm sorry for all of the confusion guys! I'm a terrible contest moderator. Okay, for now I'll leave off Copper's extra character since he submitted a main. I'll leave off Lego's secondary character for now and keep his first one mentioned in his submission (since it was his main character entry that was replaced). Should there be a shortage of extras within this week, I will make an announcement and add those two characters back in and open up Extras slots for anybody interested, submissions or not. And Obbl, you'd better create a character, or else. Also did anyone like my last 2 characters? Their semi-based off of me and my dad. And when's the time limit before we can make more extras? By the way, what "aspergers" exactly means? 1) jack has been changed to be more friendly. 3) did I make it clear steve is incredibly over protective of jack though not in the usual way? 4) seriously how much longer until they can become extras EDIT: its friday or sunday. also will they need to be altered to fit in honorables story? Okay I'd say now is a good time to open up slots to everyone now, go wild guys. Also that update is still in the works but it's nearing completion. Then I reapply my side, but as a female!